If you’ve heard rumors of a new Air Force app coming out for your smartphone or tablet, well rumor no more. It has arrived. “MyAirForceLife,” developed by the Air Force Personnel Center, is a free mobile app geared toward informing airmen and families about force support squadron morale, welfare and recreation events happening on their base, according to officials. So far, twenty locations are currently available on the app and more than 25 additional bases are adding content in order to go live in the mobile app. Users can select their favorite base or multiple locations. 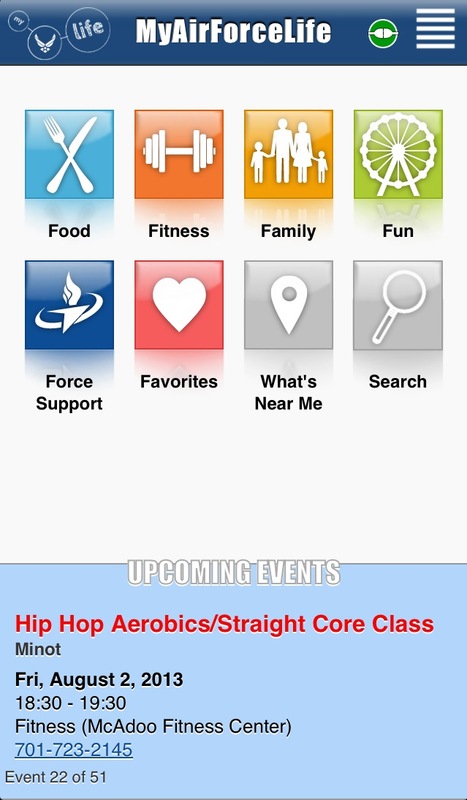 After selecting a base, the app will open the main menu which lists food options, fitness centers, family events, entertainment, a GPS locator to provide listings around you, and a “force support” option, which lists activities, events and specials geared toward Air Force living. The locations currently on the application include: Grissom ARB, Ind. ; Joint Base San Antonio-Sam Houston, Lackland, and Randolph, Texas; Joint Base Langley-Eustis, Va.; Keesler AFB, Miss. ; Lajes Field, Azores; MacDill AFB, Fla.; Little Rock AFB, Ark. ; March ARB, Calif.; Maxwell-Gunter AFB, Ala.; Minot AFB, N.D.; Mountain Home AFB, Idaho; Patrick AFB, Fla.; Schriever AFB, Colo.; Seymour Johnson AFB, N.C.; Sheppard AFB, Texas; Travis AFB, Calif.; Yokota Air Base, Japan; and the U.S. Air Force Academy, Colo. Since its release, 3,500 individuals have downloaded the “MyAirForceLife” app. Airmen interested in seeing their base added to the “MyAirForceLife” app should contact their installation’s force support squadron. Visit the service’s website at www.myairforcelife.com to learn more, and click here to download the app for Apple devices (compatible with iPhone, iPod touch, and iPad. Requires iOS 4.3 or later). Click here to download it for Google Play/Android devices. Super convenient! I really like how you can save contact information straight to your phone book, and it’s a quick way to lookup base phone/email directory information. This is especially helpful for cities with multiple instillations, like San Antonio, Texas. I highly recommend http://myairforcelife.com to all new military members living on or near an AFB.